At a treaty level, NATO is an alliance. It agrees that an attack on one is an attack on all. What it can’t deal with is war between its member. That is only partly about the wording of treaties. NATO was formed as an alliance against possible Warsaw Pact aggression. Conflicts among the interconnected nations of Western Europe have been much more complex than that. One way of reading 1914–1918 and 1939–1945 is that both had the horror of civil wars within the body of Europe. That is a very different scenario to prevent. The Schuman Plan, which began the process which has led to the EU, was a master-stroke, which was both brilliant and humble. It recognised the major fault line in both world wars had been between France and Germany, and much of the fighting had happened in the Benelux countries. It also recognised that the essential raw materials for mid-twentieth century warfare were coal and steel. It brought those industries in those countries together. The brilliance was to recognise that treaties can be broken, and so to integrated things in a way that made a re-run of the two world wars impossible. Here was a politician stepping round the weakness of politicians and wisely allowing for the capacity for human failure. What emerged was the European Coal and Steel Community. This went beyond a purely economic approach by creating four institutions: a High Authority, of independent appointees, a Common Assembly of parliamentarians, a Special Council made up ministers from the nations involved, and a court of justice. Those institutions have developed into the European Commission, European Parliament, Council of the European Union and European Court of Justice and wove democratic accountability in from the outset. Part of Johnson’s critique of David Cameron’s comments on the role of the EU in building peace is that we are unlikely to be plunged into another European war if the UK left. He has a limited point. The UK leaving would not necessarily cause everything to unravel. We would still get some of the benefits of the stability he rightly identified before his change of heart, even if we were not part of ensuring it. Membership of the EU changes what it means to be in a nation state. Within the UK, Scotland and Northern Ireland show different aspects of this. For Scotland, independence before the birth of the EU was highly questionable: Scotland would have become a small and peripheral country, with little clout to look after itself on the world stage. But although I am glad the Scots voted to remain in the UK, is clear that an independent Scotland within the EU would be much more viable because of the protections and possibilties afforded by the EU. For Northern Ireland, the armed terrorist conflict arose because it mattered to people whether they were on the UK or the Republic. At its sharpest, it mattered if London and Dublin might end up at war (or not on the same side in a war). At its crudest: would a soldier from Belfast end up shooting one from London or from Dublin? This is not so remote. In World War II the Republic was neutral. There are different stories about whether “neutral” meant leaning one way or another, but at the very least, it meant the Republic was not an ally of the UK. A soldier from Belfast was not on the same side as one from Dublin. People recycle stories and trauma. Myths get made and re-made. Eventually reality does get a look in. After nearly three decades of the UK and the Republic both being in the EU there had been time for people to adjust to there being no possibility of them being anything other than on the same side. This was also the big context in which the need/justification for violence had eased and it became possible to negotiate the Good Friday agreement that brought an end to the fighting. If we left the EU things would start to look different. Free movement of people would still apply to the Republic, so border controls would matter. The guarantee of stability would be gone. There would be a new potential for old scores and new mis-understandings to be settled violently. We would be back into potential for terror. That would be sharp precisely because the inhabitants of the North would have chosen to be with the UK and not the Republic. The sense of some in the north inhabiting a sort-of overlap world, where one can look both ways would have been replaced by clear choices. That sounds like a recipe for resentment. From a British perspective there is a convenient narrative: that there is something “wrong” with the Germans which led them into two world wars. It is convenient because it paints us as good and them as wrong. It is a fantasy that starts to disintegrate as soon as one talks with Germans or engages with German culture. We might want to overlook the British invention of concentration camps, our story of anti-semitism, and our “Mosley’s Black Shirts” to rival Hitler’s Nazis, but we too could have ended up as the aggressors. The radio play Look Who’s back, based on Timur Vermes’ novel and broadcast on the BBC in the autumn of 2015 took as its starting point the idea that Hitler turns up on the streets today, unconscious (as if dropped through time) and in Nazi uniform. He is ridiculed by the establishment, but is a hit on youtube. It is a scary reminder of how Hitler was able to garner popularity in a civilised country. The point is that some of what he says is bonkers, some is believable, and some is believed. He is castigated as a “Looney youtube Hitler”, but his channel gets lots of followers. As I write that, I am thinking of various far-right parties across Europe. Like Donald Trump in the USA, this is a world of rabble-rousers and half-truths, spoken in a way that is believed and does inflame. In Germany, the Nazis came to power by the ballot box. I am seeing scary parallels between the hysteria around that and support for the far right today. This is not to say Brexit supporters are Nazis. That would be too simplistic. It is to say that the unrealistic, jingoistic language of “taking back our borders”, “re-asserting ourselves” and “making Britain great again” have powerful resonances with the original appeal of the Nazis to German voters. The EU’s rules and instance on discussion can seem pesky. One of the things they do do is to stop this sort of popularist rabble rousing: that is much easier in one country than across 28. The danger is not that the rest of the EU declares war on Britain, but that we become the aggressor, or that Brexit would fuel further splits that undermines the EU’s capacity to hold peace. That is particularly worrying in the face of things forcing people to become migrants, whether that is the collapse of Syria today, or global warming in the future. The mentality of putting our interests first and pulling up the drawbridge is not unique to Britain, but it fuels the competition that leads to war over the collaboration that avoids it. Europe faces real problems — not least around the economy and migration — our bulwark against war now is co-operation within the EU. 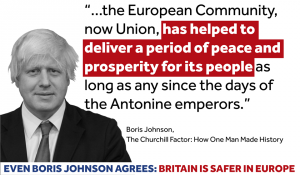 Johnson is not just wrong in what he says about the EU not contributing to peace: if people voted as he now says he wants, he would be stoking the fires of nationalism which have led to nasty conflicts in the past. This is not to say that the EU is perfect. Institutions that claim to be perfect have a nasty habit of doing serious damage. It is to say that the EU has a continuing role in building peace and stability and in adapting as circumstances change.